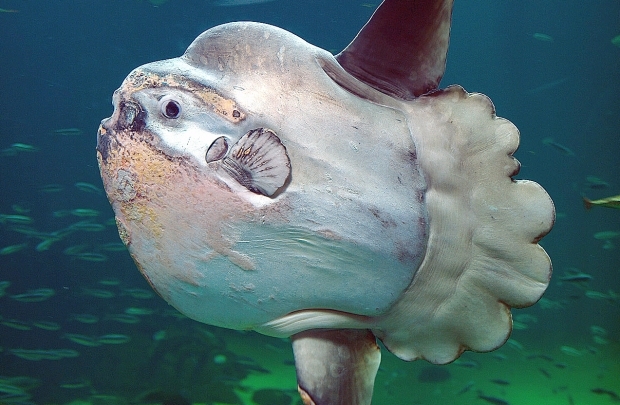 Today I want to write about a truly amazing fish, the ocean sunfish. These huge fish grow up to 4 metres long and can weigh up to 2.3 tonnes, making them the heaviest bony fish in the world. They are related to pufferfish, porcupinefish and boxfish. Unlike most fish, they don’t have scales, but have tough, thick skin that is covered in mucous. They mainly eat jellyfish, but also eat squid, crustaceans and small fish. Because of their size, they have to eat a lot of food every day. Their teeth are fused together to make a beak. At breeding time, females can produce up to 300 million eggs, which is they most of any vertebrate. The tiny babies are only 2.5 mm when they first hatch, which means that they increase in size by about 60 million by the time they are fully grown. Ocean sunfish can be found in tropical and temperate waters all around the world. They usually swim by themselves and are normally found near the surface, but can also dive a long way down to look for food. Are there any other interesting facts that you would like to share about ocean sunfish?